A character area comprising part of Pembrey Burrows, to the east of which lie part of the dune slacks that developed behind them. The area is distinctive for its recent industrial and leisure-related land use. The Burrows are an area of sand hills of comparatively recent origin, having developed since the 17th century at least and are no earlier than the Medieval period (James 1991, 159). Reclamations made to the north of the area during the 18th- and early 19th-century,, were accompanied by the development of marshland and dune slacks to the south-east of an original tongue of dry land which lay at the foot of Mynydd Penbre. This area belonged to the Manor of Pembrey but was common land in 1841 when it formed part of the 'Great Outlet' on the Pembrey tithe map. The area was developed as an industrial site in the late 19th-century when the Nobel Dynamite Company established a factory (Page 1996, 15); this was later purchased by the government and operated as the Royal Ordnance Factory. It became an industrial estate after the Second World War but was largely derelict by the early 1970s when it was acquired by the local authority, who developed it as a Country Park - now Wales' leading tourist attraction. The post-war era also saw the establishment of the Ashburnham Golf Links in the eastern half of the area. The landscape now existing in this area is almost entirely a 20th century creation. It comprises unenclosed sand hills and dune slacks/marsh lying just above sea level, which is partly forested and partly occupied by Pembrey Country Park, light industrial units and a golf course. The latter uses have all been accompanied by the profound alteration of the original landscape and topography. Many features relating to the 20th century military/industrial use of the area survive in various conditions, and include buildings, shelters, railway lines and tracks, bunkers, pillboxes etc.. 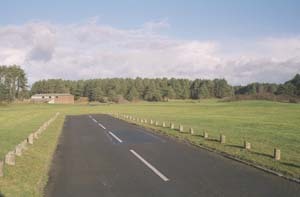 There is little underlying landscape archaeology but to the far east of the area, where it is occupied by the golf course, it is crossed by the standing earthwork of Stanley's Embankment, an inclined tramway established in the 1820s to convey coal from Stanley's New Pit, in Pembrey, to Pembrey Old Harbour (Nicholson 1991, 126). A second tramway conveyed coal from the Pembrey Canal to the harbour (see Area 163). A very distinct landscape area contrasting with a built-up area to the east, a system of late 18th-century enclosures to the north, a coniferous forest plantation to the west and unenclosed sand hills to the south.